The device under test is a PCB of size of 40 mm x 20 mm with GNSS antenna for a small tracking device again. The first DUT in this series of test is listed here. Small mobile GSM / GPS trackers are common for pets, humans or assets. Chip antennas operate as loop antennas which are magnetic antennas and are usually unaffected by being near to the body. If the device is touched or some objects come close to the antenna, the centre frequency of the antenna will not be de-tuned. You can identify loop antennas by its two (three) connection pins. One pin will be connected the GPS module and the other will be connected to ground plane. They always have a cut-out zone without copper on all layers under the antenna. The pin to connect to the GPS module under the antenna like the pin at the picture below or 90 degree turned parallel to the other pin connected to ground. Such GPS antennas with its small bandwidth always need a tuning. With passive components between the GPS module and the antenna you can shift the centre frequency. The upper graphic shows a GPS chip loop antenna on 80 mm and 40 mm long ground plane. Please note that the size of the GPS chip antenna is not to scale. 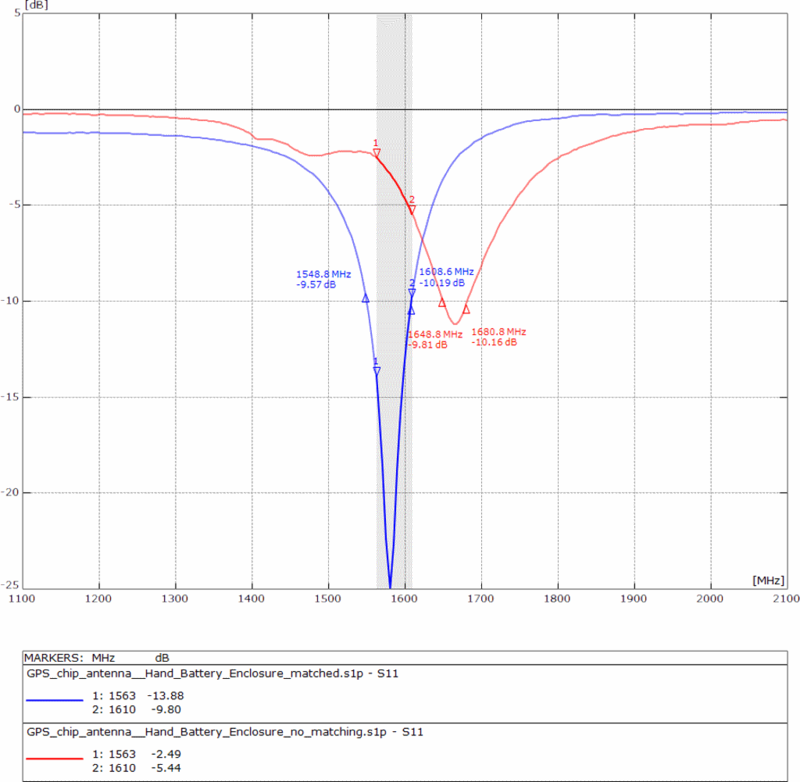 The data sheets often specify the gain and Return Loss for 80 mm only. 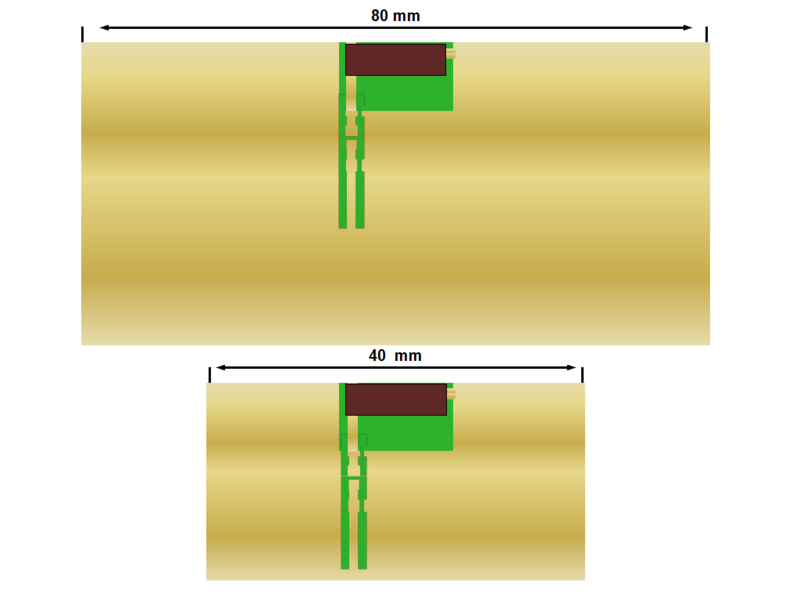 If you use a 40 mm long PCB instead of a 80 mm long PCB you will lose gain and bandwidth. If the bandwidth at 80 mm size is already at the edge then at 40 mm size it will be too small. If you move the antenna away from the centre of the 80 mm or 40 mm to the left or right side you will decrease gain as well. According to the data sheet the selected antenna is suitable for GPS. The planned GNSS module is supporting GPS with a bandwidth of 1563 MHz to 1587 MHz and Glonass with a bandwidth from 1597 MHz to 1610 MHz. Since the two GNSS bands are so close together, you can specify it as a frequency band of 1587 MHz to 1610 MHz. The additional graphs show the same GPS antenna with a simulation of different matching circuits. The red curve shows the GPS chip antenna unmatched on the PCB. The markers in black colour show the estimated -10 dB Return Loss bandwidth. By click on the red curve the markers always jump to the next legal value in the SIP file. In the list as below you will detect the measured values. In the first column you will find the frequency and in the next two columns the impedance of the antenna. By click on the curve the marker will to 1581.6 MHz and show – 9.86 dB or to 1584.8 MHz and show -10.57 dB but it will never jump on -10 dB. However -9.86 dB is fair enough. The bandwidth between the first black marker (1581.6 MHz) and the second black marker (1626.4 MHz) will be calculated by 1626.4 MHz minus 1581.6 MHz and the result is 44.8 MHz. 44 MHz bandwidth is on first quick look not to bad. The bandwidth between the two red markers is equal to the grey zone. The delta (expected bandwidth) is 1610 MHz minus 1563 MHz is 47 MHz. With 44 MHz measured bandwidth we are already close to the goal. The red curve shows the GPS chip antenna unmatched on the PCB with plastic enclosure, battery and human hand at the enclosure. The bandwidth between the two red markers is 1681 MHz – 1648 MHz = 33 MHz. This is to small but if you remember on the upper mentioned test on plain, empty PCB, then the bandwidth was already fine. Based on that we did not stopped and go ahead. The blue Return Loss curve shows the chip antenna matched inside enclosure, with LiPo battery and hold by hand. The grey zone marks the expected bandwidth for GPS/Glonass (1563 MHz to 1610 MHz). The blue markers show the bandwidth we got after matching the antenna. The delta between 1608 MHz minus 1548 MHz is already 60 MHz. A jitter by tolerances of the components in the matching circuit will not interfere a lot. The DUT has passed the test in several times. The bandwidth checked on plain empty PCB was okay. If an GPS antenna will pass this test, then you can go ahead. The basic bandwidth test is not related to a GPS chip antenna only. It is related to any other antenna as well. However the goal was to cover GPS and Glonass. For GPS plus Glonass, the antenna is useful, because the Return Loss at the edges reached -10 dB. Even with tolerances the Return Loss will stay at the limits. For small devices like tiny trackers or Bluetooth wearables it is highly recommended to select and to test the chip antennas in beginning of the development including enclosure and battery. If the antenna will not pass this first test then you can stop your design to avoid misleading and faults during operation. The DUT under tests has shown that there is a desperate need for antenna pre-tests. To avoid problems and faults there is a much better approach. 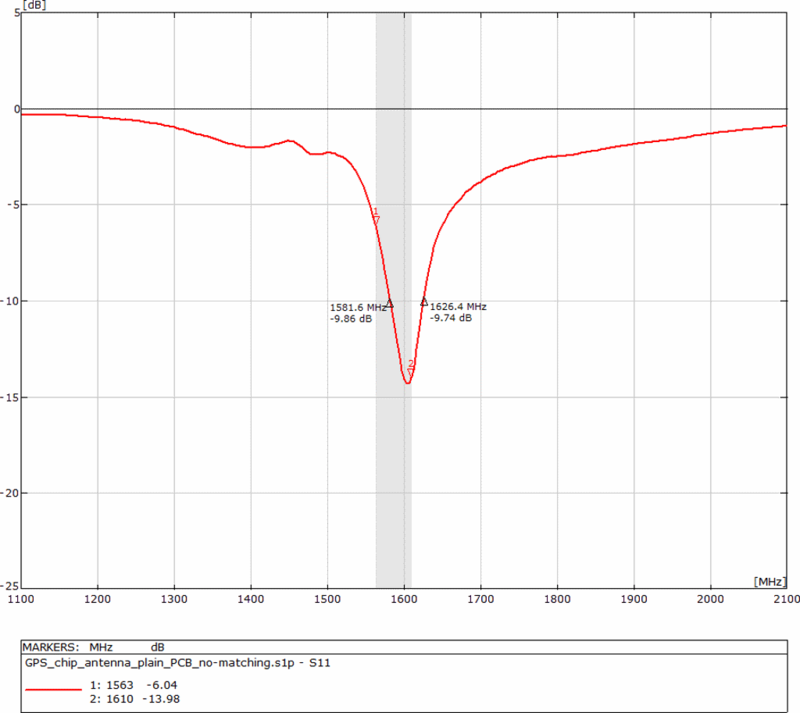 The solution is an antenna pre-test by third party for just Euro 240 including documentation on Return Loss on a non-matched antenna, simulation of the matching circuit plus matching with passive components and measurement by Vector network analyser again. The pre-test will always contain the test report and the S1P file of the origin PCB without matching. With the S1P file the customer of the pre-test can simulate matching circuits on its own again.